Editor’s Note: In the early 1990s, Xerox wasn’t just a company. “To Xerox” was a verb, reflecting the company’s singular focus on producing copying machines, and the dominance they held over that market. But faced with competition from digital imaging, Xerox has had to change their focus; they’re now in the business of client services. One reason they were able to weather that transition, says Xerox CEO Ursula Burns, is the diversity of their ranks — diversity of opinion, but especially race. In 1991, Paul Solman visited the company’s Rochester, New York, campus to report on what was, at the time, a fairly unique initiative: to recruit and mentor African-Americans within the company — not just to be a good corporate citizen, Burns points out, but because it made good business sense. That’s an initiative that she, herself, as an African-American female benefited from. Watch Paul’s report below. But after a time, Burns says, the company woke up to the fact that African-American men were doing well for themselves at Xerox, while women — of all races — were underrepresented. Xerox’s effort to recruit and retain women was their next initiative, and it’s the reason for Paul’s return to Rochester more than 20 years later. What Xerox learned, Burns says, is that inclusion initiatives can’t just include one group. That’s why the company has different professional caucus groups for employees of all different demographic persuasions to help the company understand how to be more inclusive. But again, this isn’t just a feel-goody initiative whose story is told here to win over sympathetic viewers; it’s a business decision, says Burns, that’s vital to the survival of any company — especially tech companies. Read more about that rationale below in Paul’s extended interview with Burns, and watch the segment about his return trip to Rochester. Paul Solman: Why is gender diversity good for Xerox? 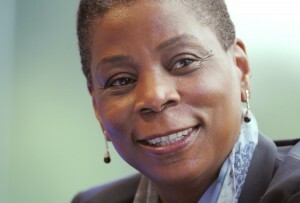 Ursula Burns: I think it’s good for all companies. Xerox found out a while ago that including more of the resources of the world to attack problems or address opportunities is better than including fewer. Think about it — half of the population is women, and by not including them actively, we start with one foot outside the circle already. They’re in our customer base, they’re in government around the world, so we have to use the resources that we have in the world better. Paul Solman: I started off doing this story basically in 1991, and the story then was about racial diversity. There are two ways to look at where that initiative got you. One, you versus Kodak, from 1991. Kodak is gone, and you guys are still in business. The other way to look at it is, you were 22nd, or 20th on the Fortune 500, but you’re now 120th. So did diversity work for you? Ursula Burns: There are two parts to the question. One is that if you think back to 1991, and just look at the Fortune whatever-the-heck-it-is, there are probably 25 companies that didn’t even exist in 1991. So part of it is that the world is changing, and technology is driving that change, and it’s good. So our position in the Fortune 500 is not as relevant as a position of success. On a different note, which is how do we do better, how does diversification of opinion, thought and background help our company do better? In 1991 we had one business. And it was basically that we reproduced things. We’re a copying machine company. That was 100 percent of our revenues. Technology transformed that business. And competition transformed it, but technology transformed it outside of our industry, very much like how technology transformed Kodak’s business outside of their industry. The thing that’s great about Xerox and the reason why — a great example of where diversity helps — is that we could look at the assets that we had, and the business and the industry as fundamentally transforming the printing industry, and try to reapply those and redirect those assets towards a different set of ways to serve our customers. We were able to do that because we had a lot of people not only from within Xerox that had grown up within this pipeline, but people from the outside, women and men, who came in and said, look at the assets that you have, and where could you use them more broadly? We are better positioned today at 121 than we were positioned in 1991 at whatever 20-something, for sure. Our business changed, and we were strong enough, fast enough and confident enough to actually reposition the entire company and the brand toward a whole big set of opportunities that are different than they were before. I don’t understand Kodak’s business model, so I can’t really speak about that. I do know something, though. We think about things like sustainability, or environmental friendliness. We think about diversity. We think about community engagement. And all these things when they first started, we had to actually build a story that said that they were good for business. Ursula Burns: The reason that we’re doing them is because they were good for business. One of the things that Xerox found out early is generally, if it’s good for society, it’s generally good for business. So you start out with this theory that we’re going to be nice to our neighbors. You’re going to actually run a responsible business on a global basis. And so things like sustainability become part of the value proposition to our customers and to the communities we work in. But also to our employees. So having a fully engaged, very active, dedicated, passionate workforce requires that you engage their whole self when they come into work. You can’t be a bad citizen and get great employees. You can’t be a non-diverse environment and get the one or two women or the one or two African Americans or Hispanics that you need that are great. You have to actually embrace the entire thing to have it work well. And so I think that our position in the world, which is still in the Fortune 500, still in a very, very good position and the leading diversified service company in the world, is based on the fact that we are a good citizen. A good corporate citizen around the world. Paul Solman: Well lots of companies aren’t diverse, though, and they’re perfectly successful not doing it. Ursula Burns: I actually don’t think there are a lot of people who are long-term successful and not doing it. Particularly tech companies. It is absolutely impossible to continue to stay in front if you continue to narrow your view. The way that you stay in front, particularly if you’re a tech company, is to engage as much difference and as much breadth as you can in thinking and approach and background and language and culture. That gives you little peeks into where some of the big opportunities will be. Tech companies, for sure, are at the forefront of diversity and have to be. And if they’re not, I think they will not last for long. Paul Solman: That suggests, though, that the diversity emphasis that Xerox was already putting on the business in 1991 might very well explain the fact that you’ve survived as well as you have until now? Paul Solman: And you would trust each other implicitly. Ursula Burns: And we would trust each other implicitly, and therefore, take a lot for granted, right? And your perspective would be excluding a lot of perspectives. So we would feel great in the room, saying, “Yeah, that was a really efficient meeting, we got it all wrapped up.” But when we walk out, and our clients are different, our workforce is different, that wouldn’t be a good business model, right? We have 6.5 to 7 billion people in the world. Half of them are women. We’re just not going to deal with those women; we’re actually going to leave that half out. We’re going to just deal with the 3.5 billion that are men. And then, by the way, we’re going to take 10 percent off because they’re African American, or 20 percent off or whatever the number is. And then we’re going to take another 30 percent off because they’re Hispanic. If we keep this going, we’ll have five people who can actually run any company in the world. That’s not a good use of resources that we have. And that’s why we have to be focusing on how do we include more, not how do we exclude more? Paul Solman: So you want men in there? Ursula Burns: Yeah, men are useful. They’re more than useful. By the way, they hold a lot of the history that’s really important for the future. So we even want older men in there because they actually help us [see] where we have been so that we don’t repeat ourselves. We want men, we want women, we want older people, we want younger people, we want anyone who can actually add value. And one of the challenges, whenever we focus on just one group, it becomes “the group,” so we’re going to actually manage that group. African American males at Xerox in the early ’90s was “the group” – primarily because there were more of them running through the educational system in the areas that were interesting to Xerox – technology and selling. So we looked up one day and all the African American men were doing better — they were leaders of the company – and there were very few women, of any race. So we said, oh my God, we need to do something about women. What we’ve learned during that time is this idea of inclusion can’t be inclusion of one group. Because as soon as you focus on one group only, then you actually then exclude the other groups. There has to be inclusion on a broader spectrum. It’s very difficult to do because generally the groups are competing against each other in some way. At Xerox, we have a whole system of what we call caucus groups, or affinity groups — we have one for women, we have one for African American women, for Asians, for Hispanics, for Hispanic women, for gays and lesbians, all kinds. And you would think all these little groups would be destructive, right? Ursula Burns: It’s actually just the opposite. They’re helpful to each other. So in your own affinity group, you find your level of comfort because you have people who are like you. So this goes back to if I had all my team being African American women; it would be really cool and easy conversation. But also, we find them working together to actually speak about what the common issues are, and that helps the company. Because we try to include everybody, we may be having some structural issues that get in the way. So these affinity groups are very useful in driving diversity into the company. They help themselves and they help the company to understand how we can be more inclusive. Paul Solman: When you hear about the effort to promote women and you look at the fact that more than half of undergraduates and graduate students are women, you’d think that the future is going to be dominated by women. So being protective of my own gender, I wonder, aren’t men going to be the people that we’re going to need to try to include? Ursula Burns: [There are] two things that have to happen for this not to be a race. One is that the entire approach here is not to have diversity just because we think it’s a nice thing to do. It’s a good business result. A good business is a growing business. By the way, if that were the case [that women dominate in the future], it’s fair, right? In the past, it was not fair. The barriers for women were structural; they were defined by law, as were the barriers for African Americans. So now we remove those, and it’s just a fair run to the games. So the men are going to have to deal with that. Second, I don’t think that we are necessarily maximizing our output as a nation or as a world — we have problems in health, we have problems in portable water, we have problems in transportation – you name it. So we don’t have to worry that every job that we make for a woman is going to take away a job from a man. That’s not the discussion here. When you walk into the world, there are more challenges than we have people skilled to attack those problems. We have to have businesses be more successful, and governments be more successful, so that we can have good minds approach this, and not run after the one flipping hamburger job. We’re at a point where, unfortunately, in America, I think, and around the world, we’re going through a little bit of contraction where jobs are fewer. But it shouldn’t be that way. We have to operate to address some of the biggest problems we have, and to approach them in an efficient way, and then more people will work, not less. Paul Solman: Are there any examples where, in a meeting of yours, a man added something that only a man can add, from the diversity point of view? Ursula Burns: A lot of it is about how we work. How we market product is a really big deal, and men or women of a certain class or diversity grouping will absolutely make points that we totally miss because we’re not included in their group. There are lots of slangs and urban vernaculars that [affect] what you call things, too. This never walked out the door at Xerox, thank God, because we had someone in the room who actually caught it. But we will call things certain names that mean something very specifically in a culture, unknowing that we’re insulting half the world, or half the Hispanic world, by saying these words, and they do get out occasionally. And there have been some pretty significant examples of where it did leak out. Paul Solman: I remember there was a detergent once that almost came out that was called “Dreck,” which means something bad in German. Do you have a specific example? Ursula Burns: Not one that I will give you! (laughter) The reason why we’re happy about it is because it never got out. Work practice is another one that’s pretty important. It’s interesting how when you look at success in a company, particularly a technology company like ours, you have to march your way through certain jobs to actually be successful. For instance, one of the places you should have spent some time [in order to move up] was in manufacturing because, at the end of the day, that was where all these great thoughts were put together and put out. But manufacturing is a very scheduled operation, generally. Without it, we couldn’t get what we call plant managers. It’s a really important job that [sets you up] to become a big product manager. We have very few women plant managers. And one of the reasons why, it turns out, is that you have to actually work the shifts in manufacturing. You have to be there from 9, or 8 to 5. And women often at that time needed a little bit more flexibility in their work to be able to take care of the broader set of responsibilities that they had. Not only children, but sometimes parents at home, or other engagements. We would put women plant managers in and they would bomb out – primarily because we had zero flexibility. We had no idea that this was a big problem, until they told us. But it turns out that it wasn’t only women who needed this, it was also young men, or men who were responsible for children or for aging parents. We now have a lot of structure that allows more inclusion of people into the workforce that have different home lives than they did before. These things we would have never, ever figured out until a woman in there said, “We’re not dumb in manufacturing; we need a lot more flexibility than you’re allowing us to have.” And we now have more than a few women plant managers and Hispanic plant managers. Paul Solman: You know, so much of this can sound so goody-goody, PBS-y… Do you have any other examples? Ursula Burns: I actually want to appeal to the intellect of the world, to the intellect of the United States. It is goody-goody, it does sound great. Okay. And it’s hard to actually pin down why good is good. I can tell you, when you see bad, you know it immediately, right? So I’m not going to actually try to sell the PBS audience on why this is good. I will tell you why it’s bad. The world is big. We have a lot of problems, and if [we exclude people] in America, we are going to fall behind. Paul Solman: When people talk about China as a rival to the United States – if it’s true that smart people drive an economy — then they have four or five times as many smart people. So are you saying, we’d better get as many of our smart people in order to stay in the game? Ursula Burns: They’re bigger than we are. That’s a fact. We’re not going to ever get to the point where we’re as big as China. All I want is for every single of our resources to be engaged. It has to become a world of cooperation. We have to hope that they’re better because we know that the 300 million people that we have in America can’t save the world. We can contribute to helping other people save the world, but we can’t do it all ourselves. If we’re all raising our standards and our participation level, the world will be a better place. This is not a competition – just like men and women. This isn’t a competition to the last crumb. We’re talking about creating a whole bunch more crumbs, so we can all compete in the world. 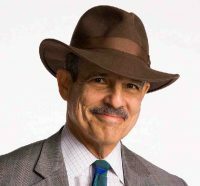 Paul Solman: Did the racial diversity initiative at Xerox in the ‘80s, ‘90s benefit you personally? Ursula Burns: Absolutely it did. No doubt about it. I am where I am not only because I worked hard and was smart, but because I had opportunities first created by a group of African American men who understood they had to broaden their scope even to include women, in particular African American women. It helped me by having a support structure. It also helped because I was noticed. It’s really an interesting thing — I say this a lot to women engineers — because they are fewer of us. So when there are fewer of you sitting in a room of 50 engineers, and there’s only one African-American female engineer, guess what? They know that you’re there. Paul Solman: The most affecting scene we had in that 1991 piece was a woman being mentored by a man, both African American, and him saying to her, yes, there aren’t a lot of African-American eligible men in Rochester, I understand why you go to New York City, but you might be able to do some important networking if you stayed in town some weekends. That ever happen to you, anything like that? Ursula Burns: A whole lot. Not just the mentoring, but the reality of being an African-American woman in Rochester without a mate. Without a husband of any shade, it didn’t matter, was a difficult situation. And one of the things that has happened in that community, not driven by me but by the fact that Xerox was getting bigger, that you know companies were investing there, was that we had a lot more diverse, eligible younger men in town, and that made it easier to attract more people. We had learned this from Corning Corporation in Corning, New York. They were talking about just literally having a barber in town that could cut African-American males’ hair; it didn’t really exist there, so literally they would have to go to some other town, New York, to get their hair cut, which is a little bit insane. So putting in place these little infrastructures that allowed more natural life to exist in the way that an African-American person would actually engage was helpful to increasing diversity. Ursula Burns: The place where the company still struggles is childcare. Families need options for childcare, and that’s where the entire world, the entire United States, has evolved to a point where we have socially devised solutions to these problems that allow women to actually engage more, and that helps us all in this inclusion journey that we’re on.